The Cape May Monarch Monitoring Project begins each year on the first of September. The first order of business today was the 3 census runs, 5-mile slow drives during which monarchs encountered along the route are tallied. For details about the census, visit our project website, http://www.monarchmonitoringproject.com/index.html, and click on the "Census" tab in the box on the lower right side. As per protocol, the census was conducted at approximately 9 am, 12 noon, and 3 pm today. The other business of the day was to orient this year's seasonal staff to our project. We're fortunate to be working with two extremely enthusiastic young biologists this year. Each brings different skills and experience to the project, and both show an intense interest in monarch migration and biology. They seem happy to be in Cape May, and we're delighted that they are here. Angela Demarse (left) comes to us from Windsor, Ontario, and most recently from Ontario's legendary Algonquin Park, where she was studying the biodiversity of the Canadian Shield ecosystem just a few weeks ago. We offer a few quotes from our correspondence with Angela that led to our eagerness to bring her onto our team. "Throughout my degree I’ve taken courses in ornithology, entomology, ecology, as well as several amazing field courses focusing on field identification of birds and other taxa, and their natural history. My passion for birds and insects has increased tenfold throughout this learning process, and now I spend all the time I can outdoors with my binoculars and bug net. Field research is my calling." "Monarch migration is a fascinating phenomenon, the specifics of which I investigated in detail in a behavioural neurobiology course last semester. So much of the behaviour is still shrouded in mystery, so the Monarch Technician position really piques my interest. I am also aware of the decline of Monarch populations in recent years due to milkweed eradication and agricultural practices, and I wish to contribute to the conservation and recovery of Monarchs through public education and scientific findings." "Insects and wildlife are passions of mine, so naturally my dream future career would allow me to pursue species and habitat protection and conservation. 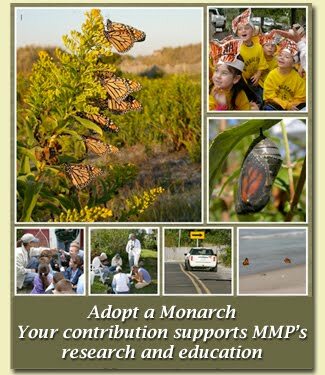 Educating the public is a hugely important factor in conservation, and the chance to speak to interested Cape May's visitors and possibly influence the way they interact with nature (for instance, by planting milkweed in their gardens or learning to rear monarchs themselves) is an exciting prospect." Lindsey Brendel, at right in the photo above, is from White Lake, Michigan, where her family has a small farm. Lindsey's background is a bit different from many of our previous team members, in that her background is more in communication than science. She has demonstrated a tremendous passion for monarch butterflies, rearing hundreds in her bedroom at home each of the last two years, producing a short film about monarch biology, and reading absolutely everything she could find about monarch natural history. As with Angela, Lindsey's words tell her story best. 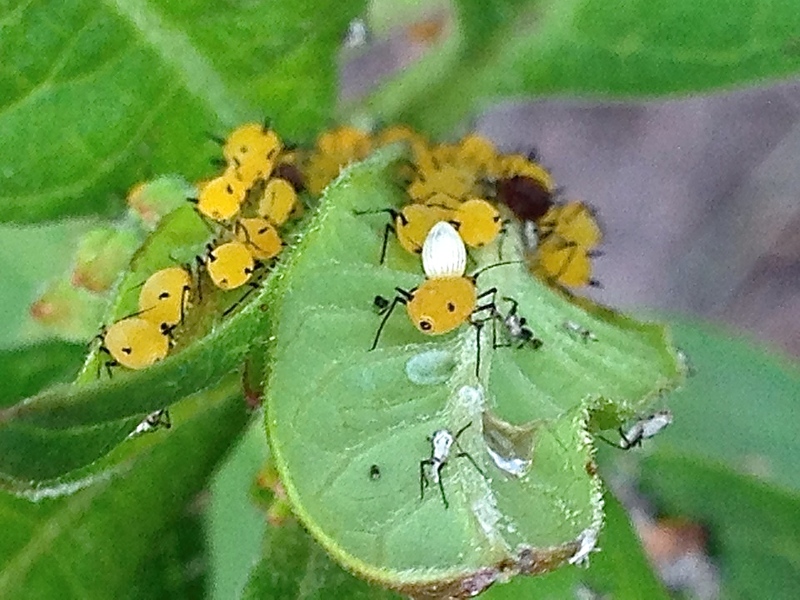 "I was first introduced to this amazing insect two years ago when I came across a black, white, and yellow striped caterpillar on a milkweed plant in one of our hay fields. My interest was immediately sparked. From that point on, I researched, raised, photographed, filmed, and wrote about this amazing animal. In my first year of conservation I raised and released eight butterflies. In 2013, I raised and released one hundred and twenty four fourth-generation monarchs. Currently, I am raising over 400 eggs and caterpillars at various instars." "I view this remarkable animal as my connection to the earth, and am constantly expanding my learning about monarchs, and sharing the knowledge I have gained with others. I have been asked to do a lecture series at my local library about monarchs, and my conservation experience." "My career ambition is to be a global storyteller and to combine my love of nature with my love of film. I aspire to be a naturalist documentarian, and educate others on conservation through documentary films. I believe that film has the power to elicit a strong connection to the viewer, and I feel that many worthy conservation causes can be further illuminated through this medium. I also enjoy writing and photography, and one day hope to publish a book on my own experience raising Monarchs. To me, this animal's ability to grow, change, and migrate is one of the most amazing occurrences on the planet, and too special not to be shared with as many people as possible, in as many ways as I can." You can see why we're excited to have Angela and Lindsey here in Cape May. We are sure that the next two months will bring us many great experiences with monarch butterflies, such as the scene at left, from this morning, when we discovered a monarch egg actually laid on the back of a milkweed-eating aphid. We're equally certain that these two talented and enthusiastic young naturalists will help us educate and inform hundreds of visitors to Cape May Point about the remarkable migration biology of monarch butterflies as they conduct the scientific studies that enable us to add to the understanding of these amazing butterflies.